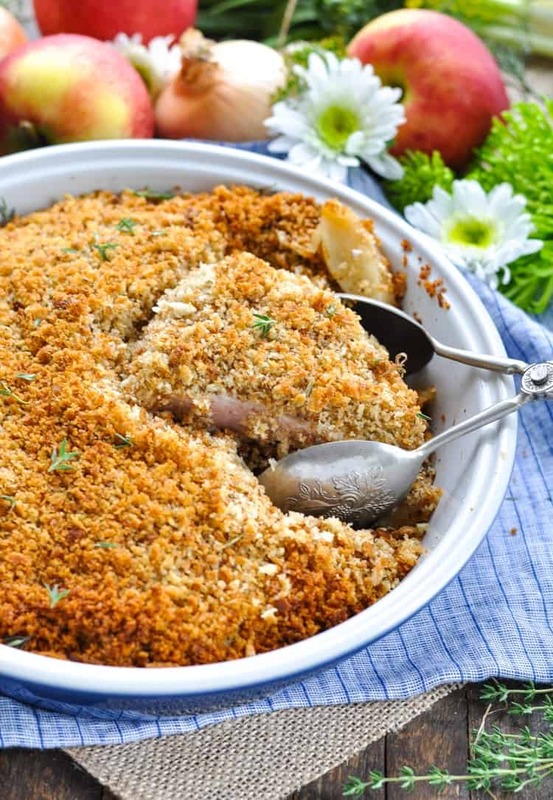 These Dump-and-Bake Boneless Pork Chops with Apples and Stuffing are full of flavor, require just a few minutes of prep, and stay moist and tender thanks to a few special tricks. Welcome autumn with an easy one dish dinner recipe! 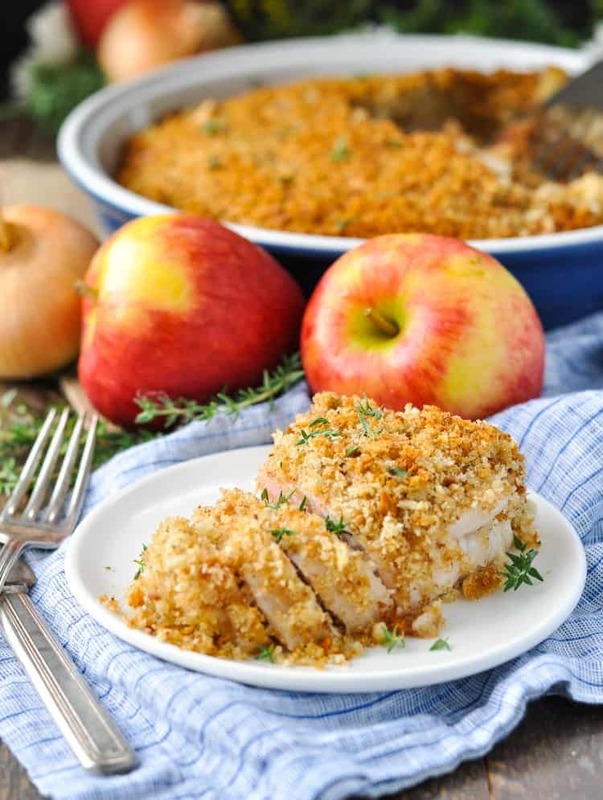 These Dump-and-Bake Boneless Pork Chops with Apples and Stuffing are full of flavor, require just a few minutes of prep, and stay moist and tender thanks to a couple of special tricks. This meal is a total weeknight game-changer! But hear me out, because after one bite of these boneless pork chops I think you’ll be pretty darn thrilled too! This meal has completely changed my mind about boneless pork chops, which I previously assumed to be dry and rather flavorless. That’s probably why you won’t find many boneless pork chop recipes on this blog…until now! If you’ve held similar beliefs about the affordable meat, then I’m about to change your mind! What good is a tasty dinner recipe if it takes for-ev-er to make? I don’t know about you, but I certainly don’t have the time (or the desire) to spend up to an hour in the kitchen each night, just to serve a meal that my family devours in about 10 minutes. No, thank you! Instead, I need quick-prep options that require minimal effort and minimal ingredients — but that deliver MAXIMUM flavor! 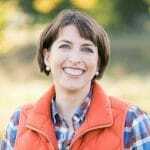 It kind of makes me look like a Super Mom (and my husband and kids don’t need to know my secrets)! 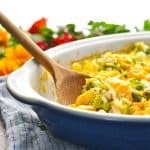 The best part about this particular recipe is that you can toss everything in one dish and then let the oven do the work. There’s no need to worry about sides, there’s no need to stand over the stove watching a pot boil, and there’s no need to stress about whether or not you’re burning supper when you get distracted by your children. You’ll start by placing the sliced apples and sliced onions in the bottom of a baking dish. I used a 10-inch round dish here, but any pan that accommodates your pork chops will work fine! 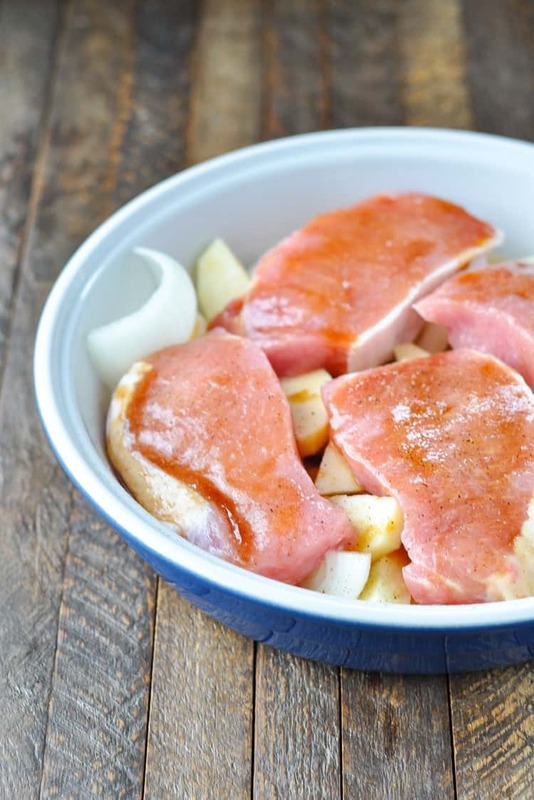 Place your boneless pork chops on top of the apples and onions (no browning in a skillet first, thank goodness! ), and the pour a simple little sauce over top. As if the apples, onions, and sauce don’t give the pork enough flavor already, then it’s time for the stuffing! And since this is a dump-and-bake dinner, you don’t even have to prepare the stuffing before adding it to your casserole. Just stir together melted butter and dry stuffing mix, and then spread that over your uncooked boneless pork chops. You should have a nice, thick layer of stuffing covering the top of your dish. With some aluminum foil on top to hold in the moisture, the boneless pork chops are ready for the oven. That’s all there is to it! You’ll want to remove the foil during the final few minutes of baking so that the topping has a chance to brown and get a bit crispy. 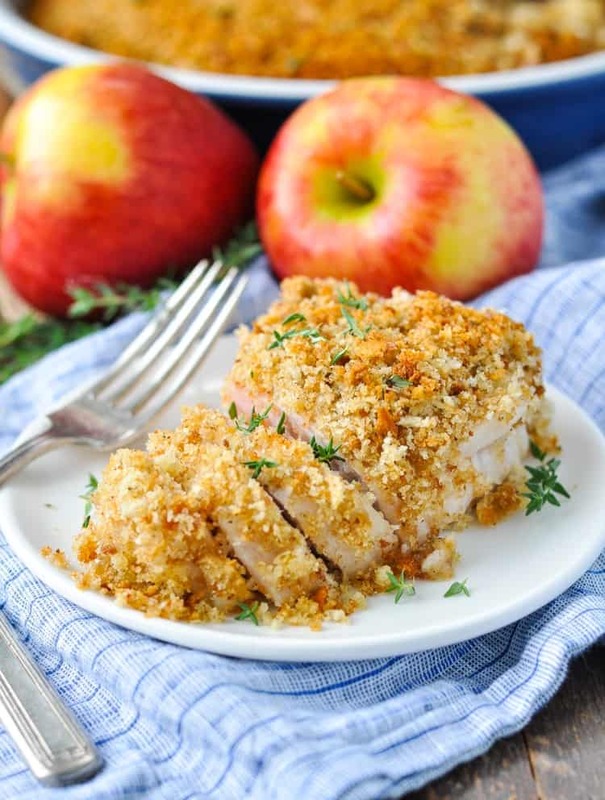 The end result is a flavorful crumb coating over the moist, tender meat! Plus, is there anything better at this time of year than baked apples? Your house is going to smell amazing while your dinner cooks! So what’s the ultimate trick to baking tender, juicy boneless pork chops? It’s layer-upon-layer of flavor and moisture. 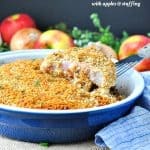 In this case, the apples and onions on the bottom of the dish lend flavor and moisture from the bottom of the chops, the sauce adds another layer of flavor and moisture on top of the chops, and the stuffing seals it all inside! Nothing gets dried out, and the end result is a sweet-and-savory dish that’s loaded with satisfying fall flavor! How’s that for an easy dump-and-bake dinner?! I buy my thick-cut pork chops in packages of two, so it’s easy to purchase and prepare two pork chops instead of 4! Just cut the remaining ingredients in half as well, and bake in a smaller dish that accommodates two pork chops. The cooking instructions remain the same. Preheat oven to 375F (190C). Spray a baking dish with cooking spray (I used a 10-inch round dish, but any dish that holds your pork chops will work). Arrange sliced onion and sliced apples in the bottom of the prepared dish. 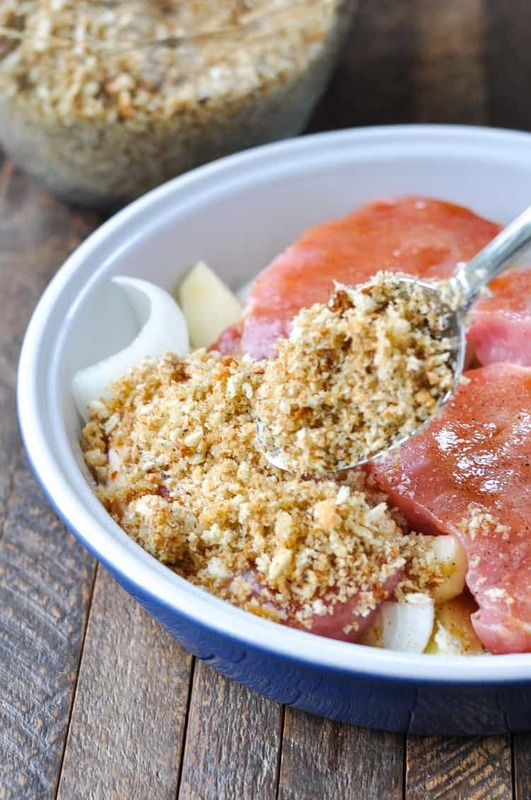 Place pork chops on top of apples and onions. Sprinkle with salt and pepper. In a small bowl (or in a jar), whisk together (or shake) soy sauce, Worcestershire sauce, brown sugar, and olive oil until completely combined. Drizzle sauce over the pork chops. In a large bowl, mix together dry stuffing mix and melted butter. Spread evenly over the pork chops. Cover dish with foil and bake in the preheated oven for 30 minutes. Remove foil and bake for an additional 10-20 minutes, or until pork is cooked through and reaches an internal temperature of 145 degrees F. The cooking time will vary based on the size and thickness of your pork chops. If the topping starts to get too brown before the pork is done, just lightly cover with foil for the remaining baking time. Cooking Just for Two? I buy my thick-cut pork chops in packages of two, so it's easy to purchase and prepare two pork chops instead of 4! Just cut the remaining ingredients in half as well, and bake in a smaller dish that accommodates two pork chops. The cooking instructions remain the same. I love the sound of this dish, Blair! What a perfect fall dinner. 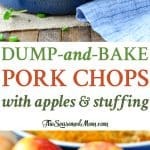 My husband is always asking for more pork chops, so I’ve got to try this. 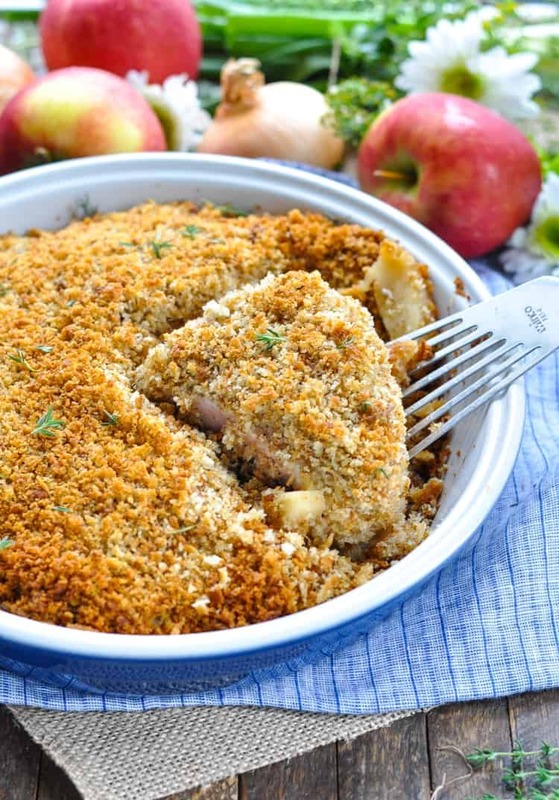 I love the apples layered underneath the chops…so creative! Hi, Tanya! I think the Stove Top stuffing brand should work equally well! Just use the same amount as called for in the recipe and follow the same instructions. 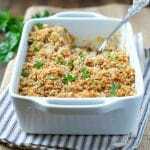 The stuffing in this dish is more like a crumb topping (not moist and soggy like when you prepare the stuffing according to package instructions). So you’re using the dry stuffing mix almost like breadcrumbs. Hope that helps! I am going to try 2 Tbsp coconut aminos (and a little salt) instead of the soysauce, worchestershire, and brown sugar. We’ll see how it goes … 🙂 But I’m excited to try it! hello, I love this idea . just One question… what type of apples should I use? Hi, Saunya! There are a lot of good apples for baking, so I would use whatever is available and appeals to your tastebuds. Some good options include: Granny Smith, Pink Lady, Gala, Honey crisp, and Fuji. 🙂 Enjoy! I made this for my husband and me, we loved it. I also put some sliced potatoes on the bottom. On our list of favourites! Wonderful, Jean! I’m so glad that you both enjoyed it! The potatoes sound like a great addition! I am not really a 🍎Eater. Actually I am not much of a fruit either. I know shame on me.! I was wondering if I could use mashed potatoes on the bottom of the dish and continue on with the rest of the recipe to follow?????? Hey, Sandy! Yes, I think the mashed potatoes will work fine. The only potential difference is that the potatoes will release less moisture in the dish than the apples, but I still think the pork will be tender and juicy. Let me know if you give it a shot! Thank you for getting back to me so quickly. I definitely will get back to you when I try this recipe out with the mashed potatoes. Loved this recipe. I used Ponzi citrus seasoned dressing & sauce as a substitute for the soy sauce, less sodium. I also reduced the temperature to 350. I know this will be a good to recipe. Thanks! Great! I’m so glad that you enjoyed it, Linda! Your changes sound perfect! I tried this amazing dish tonight and it was a big hit! I substituted the brown sugar with a bit of raw local honey (’tis the season) and it came out perfect! 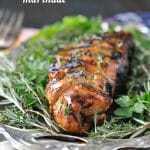 I’ve found an awesome new way to bring those boneless breadless porkchops back to life! This recipe will be a family staple for years to come. Thanks again! Wonderful! Thank you SO much for your great feedback, Nicole! The addition of honey sounds perfect, and I’m so glad that you enjoyed it! Hi Blair, This recipe was great! We have enough left over to have another night. We went apple picking again last weekend and used a few of those apples. 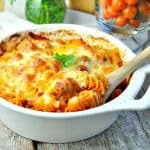 Really like all the Dump & Bake Recipes, so easy and quick to put together! This was delicious and we will definately make it again and again. So easy to prepare, but I will use more apples and onions next time. Thanks! Maybe you could use mashed potatoes (like in a shepherd’s pie)? Just another thought! Do you use a yellow or white onion? I would like to make this,but only have bone in pork chops. How do I adjust the baking time? Hi, Ashley! The cooking time will depend on the size and thickness of your bone-in pork chops, but I would increase the oven temperature to 400 degrees and use the same cooking time. Just check the chops after about 40-50 minutes and make sure that they’re at an internal temp of 145 degrees F. Enjoy! Thank you for the super fast reply! I’ll be giving it a shot here shortly. You’re so welcome. Enjoy the pork! Made this tonight. Followed the recipe exactly and it was delicious!! Definitely going into the rotation. Thanks so much! Wonderful! Thanks so much for letting me know, Christopher!! I’m so happy that you enjoyed it! Tried this recipe and it was delicious. My husband like pork chops and I am so happy to find a new recipe. I’m not sure if you’ll respond in time as I am making these now. Does steam moisten the stuffing? I thought it could use more liquid? Thanks! 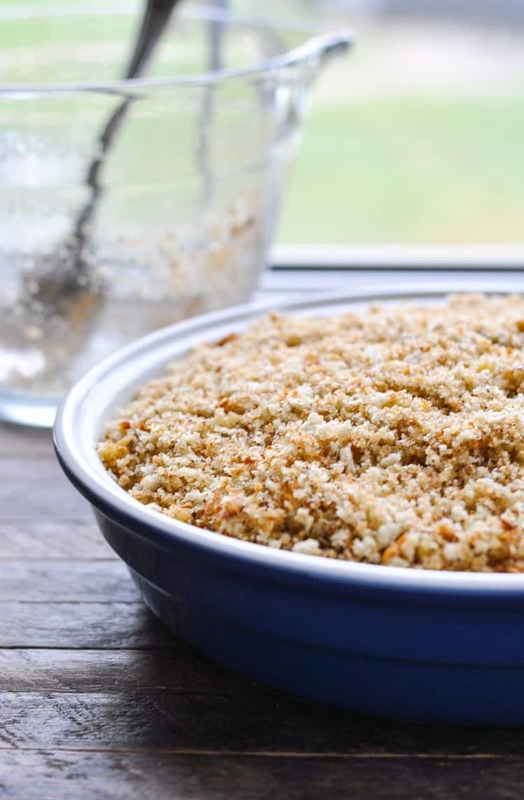 Could you use leftover thanksgiving dressing and just add it at the end of the baking time to warm it? I am making this now. Followed the directions exactly but did up the number of chops to 5. Added a little more drizzle to the liquid to accomodate. Currently ive cooked this dish for over 2 hours at 375 degrees (checking every 30-40 mins) and chops ate still not cooked to tender. I lowered oven temp to 300 and cooking it to get them tender. Apes may be mush by the time its done. This sounds delicious! Wondering what adjustment to make to the baking time if using thin chops, which my family prefers…? Hi, Erika! You can definitely use the thin pork chops instead. Can I use frozen apples? I’m always looking for a tasty fix-it & forget-it meal. This one was DELICIOUS!! My husband said the flavors were addicting. I did make a few substitutions…..leeks instead of onion, liquid amminos instead of soy sauce, and honey instead of brown sugar. I will be making this again and again and sharing it with friends. I agree with your husband — the sweet and savory combo is addicting! 🙂 Thanks so much, Robin! I agree with Chey. It took MUCH MUCH longer to cook than what the instructions.called for. I made this about two weeks ago and I’m making it again. This was so GOOD. One of the best recipes I have ever made. Gave a copy of this to a friend at work and she LOVE IT. So I’m going to check out the rest of the recipes here because if this one was so great the other must be just as good. Thank you. Also this is good to warm up next day too. Wonderful! I’m so glad that you enjoyed it, Charlene! 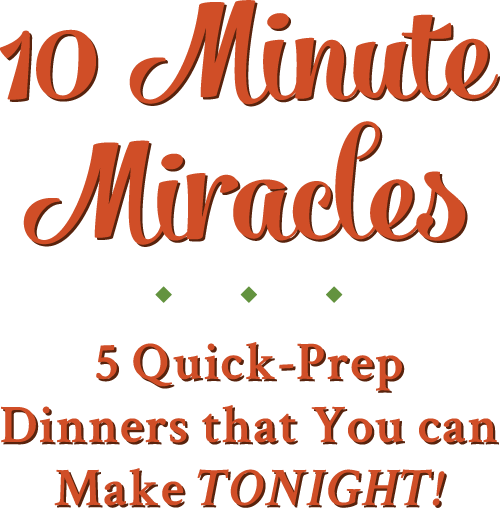 I hope that you find many other new recipes to try on the blog! I sprinkled cinnamon on top of the pork chops before I coated them in the dry stuffing mix. Adds a lot more flavor, and Fall type feel, with the cinnamon. Great recipe!! Great tip, Abby! I love the fall flavors in this dish, too!